9:05 am: Woke up and immediately thought, "I have to take pictures!!" I could smell coffee and knew Mike was still downstairs. A few minutes later, Caroline came running in the room to kiss me good morning, as she always does. 10:20 am: Mike is off to work in the rain. I ask him to give me a goodbye wave as he heads out the door so I can get a pic so he snarls and says something in an Elvis or Rat Pack kind of voice. Never serious! Always a mess!! Kind of annoying. I normally don't see him in the morning so I'll take it. 11:00 am: I sit down to work at my desk and go over e-mails, social media, etc. until I realize it's noon and I haven't eaten a bite. Caroline is hungry too so I make us an egg sandwich on delightfully fresh Pepperidge Farm wheat bread and then feel irritated that my clean kitchen is now a mess. After we eat, I clean it or it will nag me in my mind until I do. 12:30 pm: I write a blog post for today and start this one for tomorrow. I'm in my pajamas so I haven't taken a photo of myself but I'll fix that when we go out later. If I can get at least four good pictures from the day, I'll feel it's a success. Trying to decide what to do with my day. It's raining out and it makes me feel sleepy, plus, I'm never productive on Mondays. It takes me a while to get in the swing of the week. Kind of like waking up after a weekend nap. I should be a whirlwind of productivity on Monday and jumpstart my week. Instead I use it to plan and ease my way into life. For the next hour, I think through my calendar, answer more e-mails, answer some texts and plan the rest of my month. I always feel better when every day has a purpose. 2:00 pm - I'm sleepy because it's raining and it's Monday so I give up trying to be productive and just watch my guilty pleasure, "White Collar" on Netflix until Caroline asks me when we're going to dinner. 4:40 pm - My sister calls and we make plans to go to Chick-Fil-A. She comes by the house and I grab my camera. As she's coming up the walk, I say, "Surprise - it's week in the life!" and snap a pic. Being the good sport she is - she smiles and I capture her cute self. 5:40 pm - Dinner was great and then we waited in line for a Frosted Lemonade. I got one and when I sat it down on the counter, it turned over and went down my shirt. Not fun! My sister snapped this pic which I do not love but will use anyway. 7:00 pm - Caroline and I pull in the driveway the same time as Mike. We all jump on our bikes and head to the cul-de-sac to ride because it's a cool night with a great breeze. I ask Caroline to get a pic of me but they all turn out horrible! I may bring my tripod out tomorrow and ride past it. A girl's gotta do what a girl's gotta do! 7:15 pm - Caroline spots her friend up the street so she goes off to talk to her and I sit on the porch and swing as the birds sing and a cool breeze blows. Heaven. 7:30 pm - Mike comes out, ready for a run and refuses to let me snap a pic. I snap one anyway. :) He and Caroline stay outside until way after dark while I chill on the couch thinking of how I can get better pictures of myself this week. 8:00 pm - I start to watch MasterChef from last week but decide instead to do a Periscope and talk about my first day of WITL. Tiffany isn't up for it so I quickly message Megan Anderson and we decide to chat as soon as she gets home. I really just want to be chatty with someone about this project. 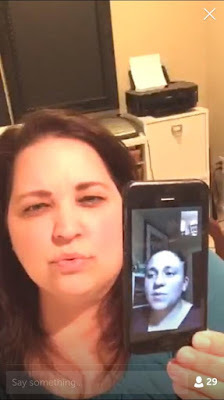 8:45 pm - I do a Periscope for about 10 minutes and we have fun talking about our pictures. 9:00 - midnight - More "White Collar" on Netflix, finish this blog post and go to bed! Happy week in the life! FAB recap! its making me think deeper into my days!! Love the recap! You sooo need to do the riding past the camera set up on a tripod! This makes me want to use my blog for capturing this week. Hmmm. You did such an awesome job with the times and everything! I didn't get that detailed on Monday but will try that for Tuesday :) love them photo of your daughter on her bike. What a beautiful family you have! Really enjoyed "seeing" your day!!! You did a great job and I'm glad that at least you're in a couple of the photos! !